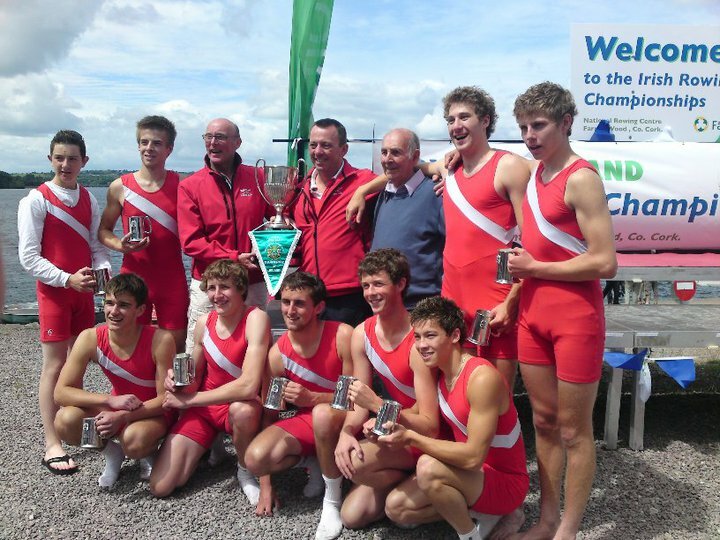 In their greatest ever day, at the 2010 Irish National Rowing Championships in Cork, Bann Rowing Club won the biggest prize in Irish Junior Rowing , the mens J18 eights, and also took silver in the mens J18 fours. This is truly remarkable when you consider that it is the first time that a complete Bann crew have ever won the MJ18 gold in their 146 year history, it is their tenth Championship Gold in 146 years, and it is their first Gold from The Irish Championships for 26 years since way back in 1984. Championship momentum had been building up at the Bann Club with this “golden” crew seeking to complete a superb, unbeaten run which stretches right back to July 2009. 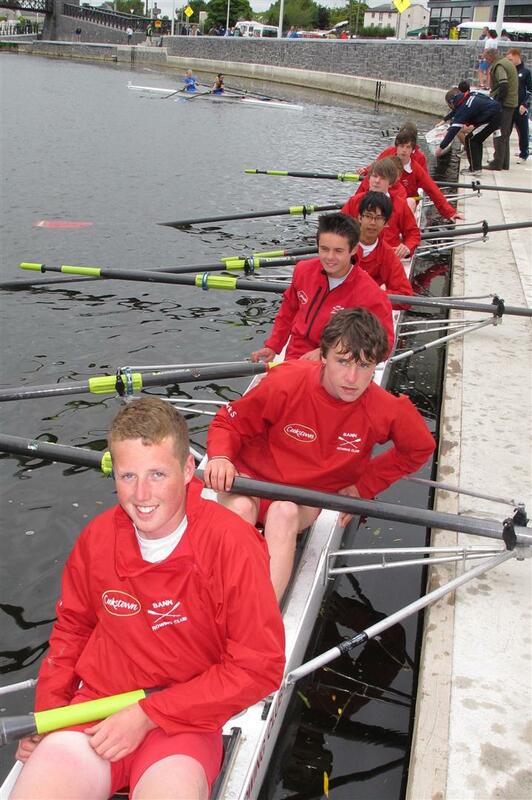 To improve on the previous years’s Championship silver, won in a time of 6:40.2 in poor, wet conditions, and to win gold in 2010, the Bann crew would, most probably, have to be capable of breaking the magical six minute barrier for 2,000 meters. Many International senior “eights races” are won in times of over six minutes so this incredible target“on the water” time for 2010, meant many sacrifices and a full year of extreme, sustained, training under coach Seamus Reynolds. Recent highlights for the crew included their top ten place in the London 2010 Schools Head, which is the highest ever finish by any Irish crew, over the 6,800m Oxford Cambridge Boat Race championship course. 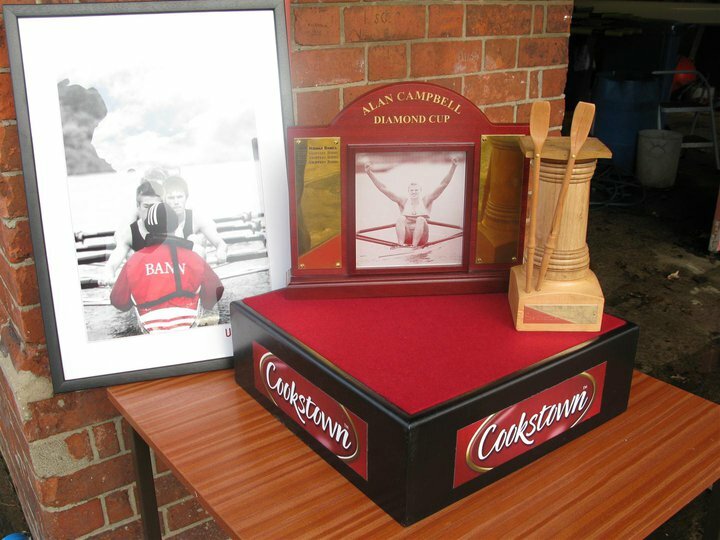 In May “Cookstown” had come onboard as supporters of Bann, and this had enabled the club to purchase their new Janousek racing eight boat, aptly called”The Sizzler.” When Mrs. Gillian Chambers officially named this new boat, she said that she hoped its bowball would always cross the finishing line first. Respecting her wishes, over the past nine races, all over Ireland, “the Sizzler” had remained unbeaten. Bann Rowing Club’s development squad, had raced in “the Sizzler” when victorious in the recent 2010 Northern Ireland MJ16 eights championship and retaining the “Craig Cup.” Good MJ18 wins had followed at the Metro and Athlone regattas, but on the long journey down to Cork everyone knew that “on the water” at the National Rowing Centre, was “where it counts” and that this was the elite,“creme de la creme”of Irish Rowing Clubs competing for the biggest “Pot”. Of course all the “big guns” from Portora, Commercial, Presentation College and last year’s champions St. Josephs, the “Bish” from Galway, were again competing against Bann, but a major surprise was the last minute entry from the fabulous Skibbereen Club. The “Skib” Club has won an incredible 109 Championship gold medals in the last thirteen years and have attained a richly deserved and almost legendary status and reputation in Irish Rowing. So, that’s the race background, Bann’s golden unbeaten crew,racing against all the top Clubs in Ireland, including”Skib”, all competing for one single prize, the National Championship GOLD. All the big Clubs had successfully negotiated their way through the semi-finals and the pressure cooker of excitement and weight of expectation was now really starting to kick in, and so coach Seamus Reynolds protected his crew over the final two hour wait, from friends and foes alike, including the vast travelling army of parents,families and supporters who had all made the long journey down to Cork for the big race. From the second that the Bann “Golden Crew” launched, for the final time as a J18 crew, and took that first, big, ”square blades, firm “stroke, with perfect balance, we all felt something very special was going to happen. The packed spectator gallery had no problems identifying the Bann eight rowing past on their way down to the start, with their distinctive scarlet and white colours, and equally distinctive, Bann’s unique rowing technique. The spectating crowd’s roaring, chanting and stomping erupted crazily when the race commentator announced that the six rival crews had now taken their stations on the stake boats and that the biggest race of their lives was about to start. Two questions would be answered very shortly. Who would win? and could anyone beat that magical six minute race time ? The commentator announced,”And they’re off” and a whirr of power strokes saw all six crews get away cleanly. At this vital early stage of the race, the complete trust of Seamus and the whole Bann Club rested on the shoulders of two sixteen year olds, stroke man Joel Cassells and cox Ryan “Acer” Hourican. With unbelievable coolness the exact rate set by the coach was executed so that the entire crew could now work flat out for every inch of the race. In Bann’s race plan, the progression from the “acceleration phase” to the “attain and maintain top racing speed phase” called “the Stride” was achieved so smoothly that the Bann men easing into a small lead by 500m looked almost effortless, just like the running of the superb Olympian sprint Champion Usain Bolt. Similarily, the sheer amount of power that the Bann eight were generating was masked by the fluidity of their rowing technique. The average weight of the Bann crew at 75kg per man couldn’t reveal if they had the necessary amounts of power, endurance, determination, boatspeed and pure heart which would be required. This race was now the ultimate acid test. With exactly 500m left to go, the entire Bann crew began to sense that the gold was becoming theirs, and, as planned, they now increased their stroke rate slightly, relaxed, sat up tall, and slowly, steadily, almost imperceptibly, started creeping further away from the chasing field. The “Sizzler” just kept accelerating, and gaining speed with every stroke. It was unbelievable. The last 250 meters are marked by yellow lane buoys. All the Bann crew saw this, knew what it meant, and, with wild, wild cheering from the stands, and big, long, hard, clean power -strokes, the golden Bann crew absolutly flew over the finishing line. The hooter sounded that the race was over and that the “Sizzler’s” bowball had yet again,crossed the finishing line first. History had been made. Skibbereen hurtled in next for silver, followed by Portora who had to settle for another bronze, very closely followed by “Bish” the previous year’s champions. 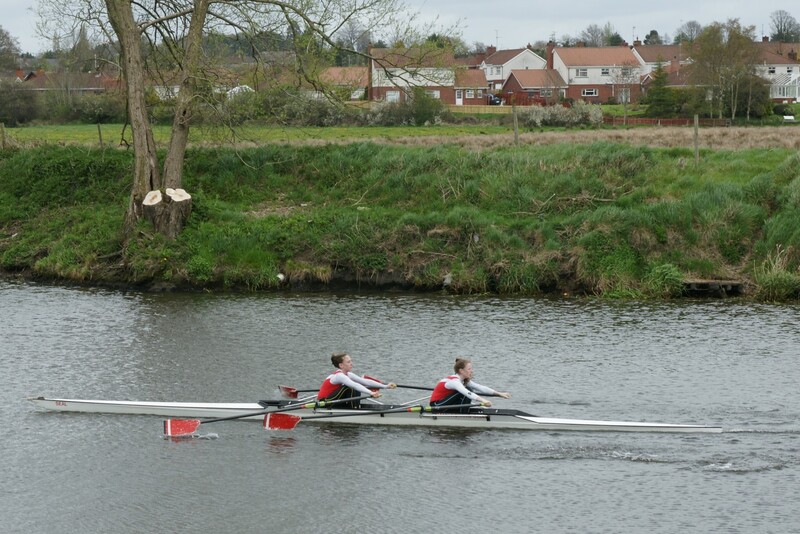 The winning margin was declared as a length and a third meaning that Bann had established clear water between them and “Skib”which, in Championship rowing terms, is a very good win. So the first big question had now been answered,”Who would win ?” Answer Bann. The second question took just a little longer, “Would Bann have managed to break the magical six minute barrier ?” Answer… Yes. Bann’s winning time was 5:54.4. Infact, out of the six excellent crews in the 2010 final, no less than four of them beat six minutes, with Bann 5:54.4, Skibbereen 5:57.6, Portora 5:59.2 and St. Josephs College at 5:59.9. The quality of this MJ18 race was not lost on Martin Corcoran, Chief Executive Officer of the Irish Amateur Rowing Union, who said that, to the best of his knowledge, having four crews under six minutes in a MJ18 final had never happened before. He added that Bann‘s race time was a mere three seconds from qualifying them for the Senior Mens final. 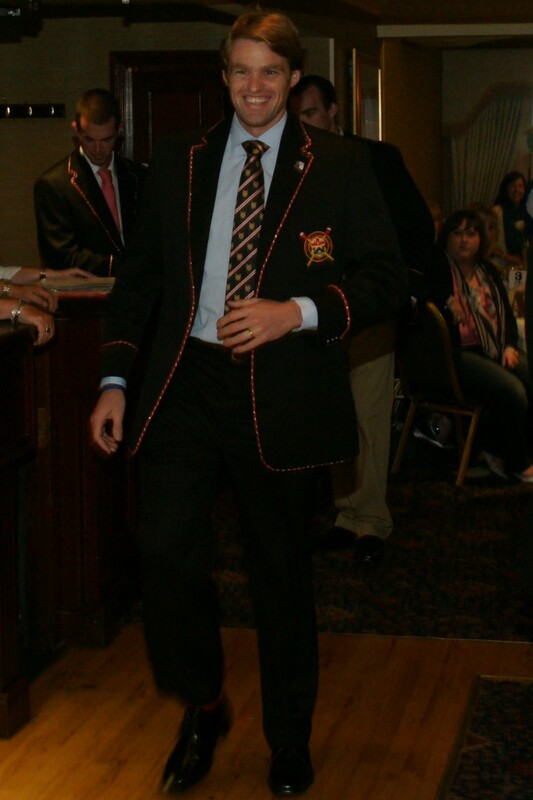 The President of the Irish Amateur Rowing Association, Tony Dooley, warmly congratulated the Bann Club on their historic victory and also for their sporting behaviour. He remarked that he had witnessed Bann crews applauding other crews , while all were still out on the water after their race, and then on the launching platforms, when the crews had arrived back in, there were the Bann men again, all shaking hands with every single member of the other crews. Strong emotions of relief and joy were expressed and balanced with the knowledge that this glorious race would infact be the last one together for this unbeaten golden Bann MJ18 crew. All present reflected together that their three year “Rowing for Bann” journey, had really started back at the 2008 Craig Cup up at Portora, and was now ending on the crest of the wave, with their greatest victory, at National Championship level, which the highest level attainable in MJ18 Irish Club rowing. As an enormous honour to the Bann Club, Tom Fennessey from Clonmel, Past Chairman of the IARA, requested for Bobbie Platt MBE, the Bann Rowing Club President, to do the Honours and present the Bann winning Crew with their awards and the huge, prestigious Irish National Championship MJ18 Silver Cup.